I've always loved baking and so over the years I have accumulated a large number of baking pans in all shapes and sizes. Some of them although loved are under used. A tart pan is one of those pans that gets lost in the pantry. 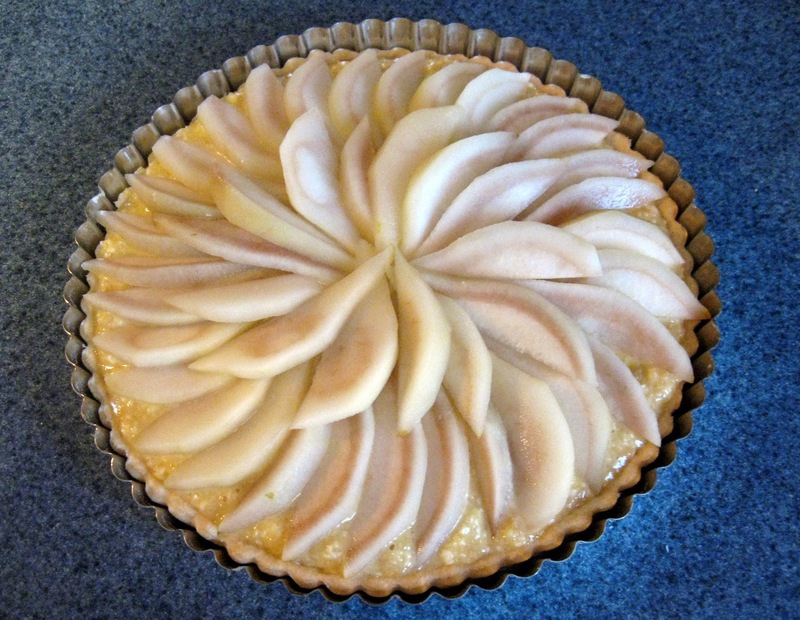 A tart can be so many flavors just like most other desserts and it's usually fairly simple with a beautiful presentation. Bonus...they're usually filled with fruit, that makes them healthy right? :). 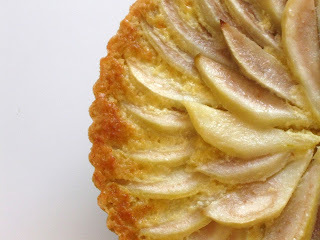 I have several recipe lined up to use in my tart pan but when I saw a recipe for a Pear Frangipane Tart I had to make it. For one, I had 3 pears in my refrigerator waiting patiently to be used and I had some almond slivers :) If I have everyone on hand for a recipe it would be a waste not to make it. 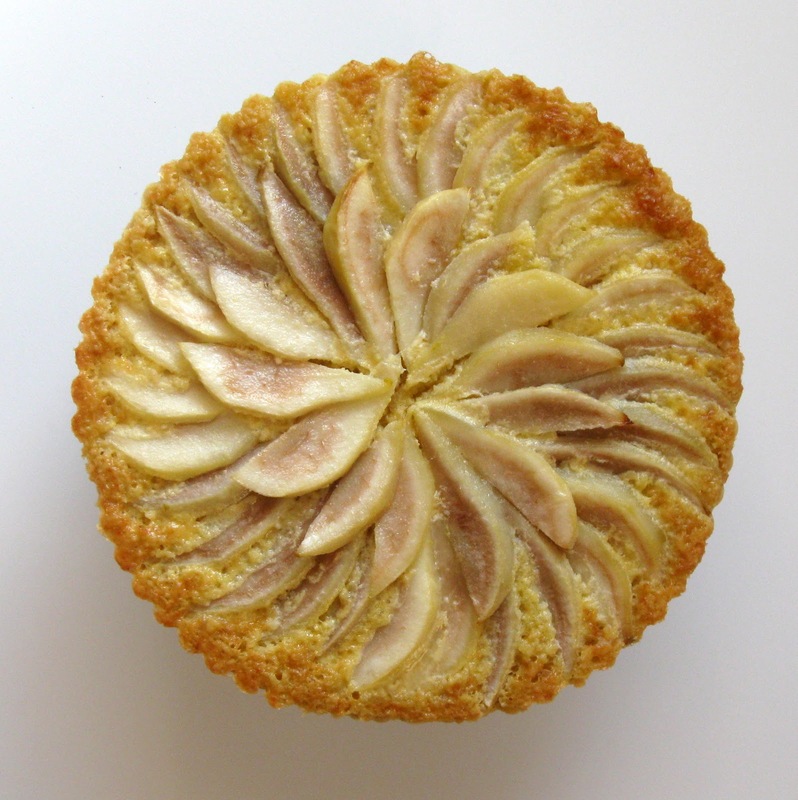 Frangipane refers to an almond filling, whether it's made with almonds or flavored like almonds. It's usually make with almonds, flour, sugar, and butter. Sometimes vanilla is thrown in there also. This recipe is no exception, it has all of those delicious ingredients. I suppose I will look into healthier recipes for the New Year since most people will be watching their weight and I'm all about bread and desserts. I'll look into it. It's not the New Year yet so you can still splurge a little, yes? Pulse first 3 ingredients in a food processor until mixture is crumbly. Slowly add ice water through food chute, pulsing until mixture forms a ball. Flatten dough to a 6" disc; wrap in plastic wrap and chill 1 hour. Process almonds in food processor until finely ground. Combine almonds, 1/2 cup sugar, and 2 tablespoons flour in a small bowl; set aside. Beat softened butter, eggs, powdered sugar, and 1/4 teaspoon salt at medium speed of an electric mixer until creamy. Combine almond and butter mixtures. Cover and chill 1 hour. Roll pastry to 1/8" thickness on a floured surface. Fit pastry into a 10" tart pan; place on a baking sheet. Bake at 425° for 12 minutes. Cool. Reduce oven temperature to 400°. Combine wine, 2 cups water, 1 cup sugar, and vanilla in a large saucepan; bring just to a boil. Add pears and simmer 8 minutes. Remove from heat. Cool pears completely in liquid. Remove pears and pat dry. Reserve 1 cup poaching liquid. Cut pears in half vertically, remove cores, and cut pears into 1/4" thick lengthwise slices, keeping stem ends intact. Spread almond mixture into baked tart shell. 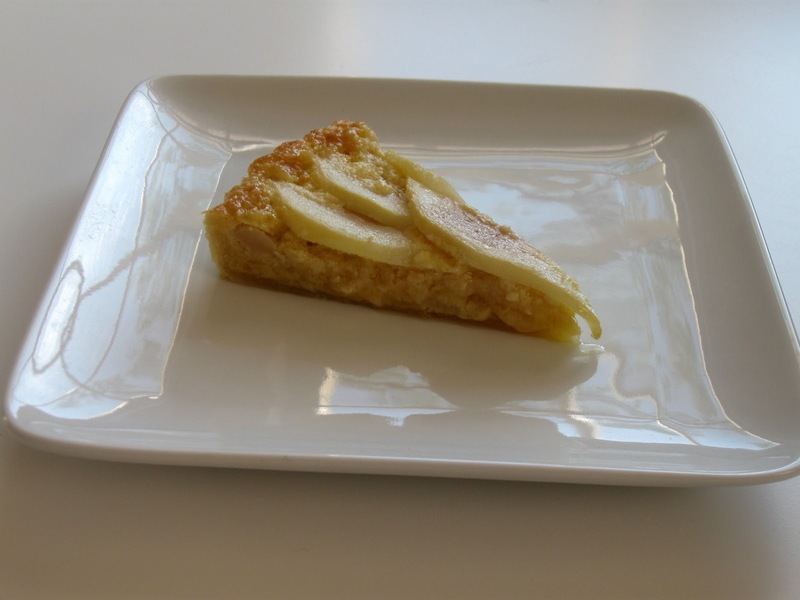 Arrange sliced pear halves over almond mixture, stem ends toward center. Fan pears slightly. Brush pears with melted butter. Bake at 400° for 30 minutes or until golden. Combine reserved 1 cup poaching liquid and cornstarch in a small saucepan, stirring until smooth. Cook over medium heat, stirring constantly, until mixture thickens. Boil 1 minute, stirring constantly. Remove from heat. Brush tart with glaze mixture. Remove sides of tart pan before serving. Visions of Sugar Plums dancing in my head!